This is a page about Hokusai’s Animals　for the Sumida Hokusai Museum. Animals have been one of the greatest inspirational resources for numerous artists around the world, Hokusai was certainly not an exception leaving various works of animals. A master of capturing the characteristics of his subjects, Hokusai depicted not only the attractiveness of animals but their distinctive realities. Some of animals represent quite delicate expressions particularly on the shape of their eyes. 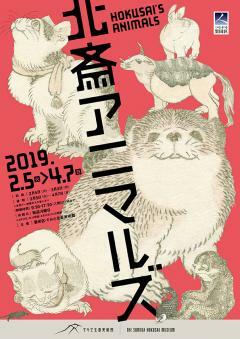 This exhibition introduces the portrayals of animals by Hokusai and his pupils: the design for toys and tools in daily life, the illustration for myths and legends, and the embodiment of imaginative animals. Animals, So Alive Hokusai painted creatures large and small throughout his career, striving to bring them to life with his brush. Here we present the vivid animals that Hokusai and his students depicted. As you explore them, please note the distinctive depictions of eyes found in Hokusai’s work. Adorable Animals This section brings together particularly charming animal pictures by Hokusai and his students. Among them lurk creatures that may seem rather pesky but, upon inspection, are adorable indeed. Let Hokusai’s heartwarming animals bring you joy. Animals Only in Paintings Hokusai did not confine himself to painting actual animals. He depicted animals turned into toys or textile designs. He also drew the animals that figured in familiar legends and tales, in which animal specters and monsters often appear. In his day, people believed in kappa (water sprites) and kamaitachi (slashing weasels), and Hokusai depicted them just as he did other animals. Here, then, please enjoy animals you will never see in a zoo, animals that exist only in paintings.